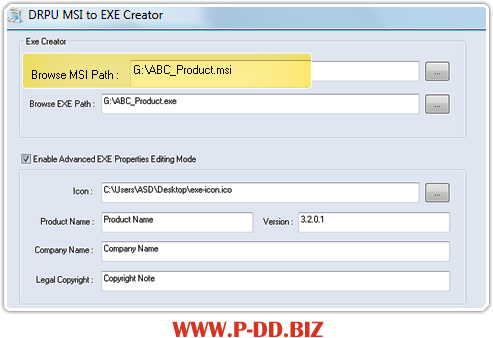 MSI to EXE Setup Creator extremely easy to use setup builder that creates and builds EXE format file from existing MSI format file. All this is achieved in very less time and without changing the originality of the actual Windows Installer (MSI) file. MSI to exe setup package converter tool provides support to all versions of Windows operating system including Windows 98, ME, NT, 2003, 2000, XP (Home, Professional, and Media Center Edition) and Windows Vista (Vista Starter, Vista Home Basic, Vista Home Premium, Vista Business, Vista Ultimate and Vista Enterprise). Setup maker provides the facility of storing the created EXE file at user specified location for future reference. A flexible solution of setup conversion utility converts existing Windows Installer setup package into exe setup installation package. Facilitate saving the created exe file at specified location for users future purpose. Flexible and affordable setup generator utility is useful for software developers and professional programmers. Support all versions of Windows Operating System i.e. windows 98, ME, NT, 2003, 2000, XP of all editions. Help manual is provided for user’s assistance and does not require any technical knowledge or skills to operate it.